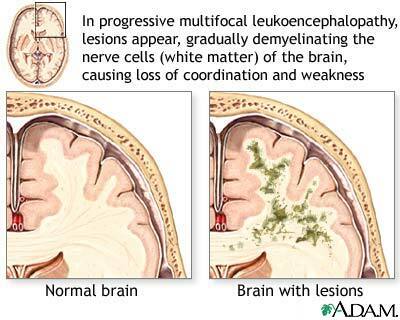 Progressive multifocal leukoencephalopathy is an advancing viral inflammation of the white matter of the brain. Immunosuppressed people are more susceptible to this disorder than the general population. Evidence of the disease may be a person's recent loss of coordination and weakness, progressing to a loss of language, visual problems and headaches.